While Ireland might have been neutral during WWII, it doesn’t mean that the war didn’t effect the lives of it’s Irish residents. Kitty in Dunkerrin, a small town in the middle of Ireland. 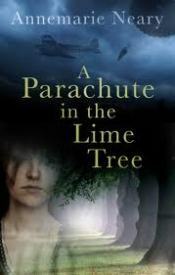 One morning she wakes up to find a parachute hanging from one of her lime trees. The previous night, Belfast was hit by Luftwaffe air raiders so Kitty can only assume the parachute belongs to a German. She later finds the airman raiding her kitchen and injured. Hi name is Oskar and he explains that he has deserted the war and wishes her no harm. Kitty agrees to help Oskar. Oskar has one mission in mind when he jumps from the airplane…..to find his one true love, Elsa. Elsa was a neighbor girl back home in Germany that he loved dearly, but as Hitler took power and started rounding up the Jews, Elsa’s family rushed her to their family in Belgium for safe keeping. Before Belgium was occupied, she was smuggled out of the country to Ireland thanks to the Kindertransport. Oskar kept track of Elsa’s whereabouts in the beginning, but lost her after she made it to Ireland so when he sees an opportunity he jumps….literally. In Ireland, Elsa is trying to cope with her new life and wonders what happened to her family back in Germany. She is only seventeen and trying to move on with her life and adjust to the new culture….the only thing Elsa find comfort in is her piano. Charlie is a young medical student who happens to hear Elsa play her piano and from that moment on he is completely taken with her. Gradually, Charlie and Elsa find love and comfort in each other, while Oskar continues his search for Elsa, and Kitty hopes to claim Oskar for herself….but as we all know, war changes everything. This is a gripping war time love story that demonstrates how war and time change people. What you once wanted at one point in your life, may not be what you want now. I think that is especially the case with Elsa, while she might have loved Oskar at some point in her own way, she ended up with Charlie. Love can take many forms and sometimes there isn’t such a thing as ‘one great love’….there can be many different loves, that is what made this novel for me. Charlie was tender and nurturing, I felt he really loved Elsa and would cherish her thru thick and thin. It was easy for Elsa to fall in love with him….he was there for her and helped her through some of the darkest moments in her life. This bond was strong so I thought they worked well as a couple. The only character that I could never warm up to though was Oskar….while Kitty was very naive and childish at times, I felt like her naïvety was realistic for her age. I thought it was believable that she fall in love with Oskar…he was new, exciting, exotic, and more importantly he was entirely dependent on her….how could she not fall in love with him? But Oskar….I just never felt a connection with his over all character. I never felt that he loved Elsa either, it seemed more like an infatuation and not love. I did hope for a little more background information on the characters though. I didn’t feel like I fully understood Oskar’s motivations or Kitty’s at times, so I think having more background info on them might have been helpful. I did love how the story and lives of the characters intertwined and came together in the end….very well done and moving. I also really enjoyed learning about Ireland’s involvement in the war. I don’t know much about Irish history, particularly the modern era but this book gave great background information for the reader. Clearly the author has done her research and presented it in a way that is easy for the reader to understand and process. I really enjoyed her writing style once I got used to it. It was a little confusing at first with the way the characters were presented but by the second POV chapter I had everything worked out. Overall, this was a well written novel that brought a lot of depth and historic significance to the audience. I enjoyed the story and the ending was fitting, albeit sad. This is one book you don’t want to miss, especially if you love war time romances.